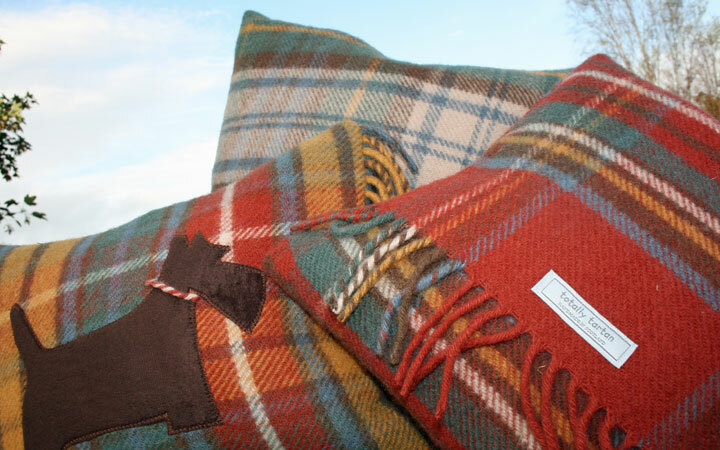 Totally Tartan’s range includes tartan cushions made with authentic Scottish tartans and the softest lambs wool. We also have quirky Scottie dog cushions that make ideal gifts for any one with a Westie or Scottie dog. We also offer tartan draught excluders and throws that will prove essential this winter as environmental concerns see us all turning our thermostats down. My latest collection is the very finest in Scottish gifts and tartan cushion. The Saltire and our Lion Rampant created in the most beautiful tweeds and plaids, subtle yet the statement you've been looking for that states taste, elegance and Scotland. And what would a Scottish Collection be without a thistle. This stunning cushion is made in 3 different colours and coordinates beautifully with the rest of the Scottish tartan cushions. So whether you’re looking for a memento of a trip to Scotland, an inspired gift for a Scottish friend or something that tells the world about your Scottish heritage, Totally tartan has something for you. In addition tartan is bang on trend at the moment. Catwalks and top-notch interior designers are all turning to tartan to bring their creations to life. And it’s easy to see why – the lively shades tone perfectly with today’s lifestyle palette.